If you’re looking for the best log splitter in the world, the 5, 7, 8 and 10-ton Boss electric log splitters are all capable enough for the title; they’re powerful, functional, and built to last. Though they’re on the expensive side, they provide more than enough value to make up for it. Designed to keep logs firmly in place while they’re being split, they're ridiculously easy to operate and exceedingly safe to use. Whether you’re looking to split logs indoors or outdoors, these log splitters will accommodate you. 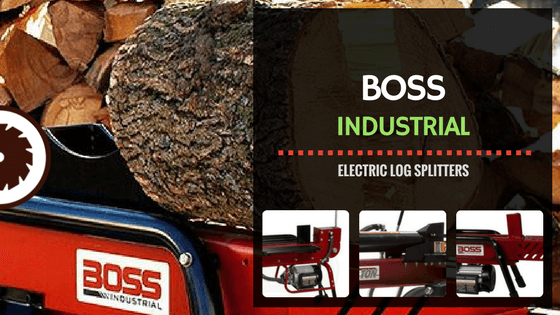 Let’s start our Boss industrial log splitter reviews off by talking about their overall construction and design quality. Made out of heavy-duty steel, these log splitters are heavy, sturdy, and built to withstand loads of wear and tear. They can be used anywhere, from garages to backyards, to heavily wooded areas, and more. The 5, 7, and 8-ton splitters all weigh in at just a little over 100 pounds. While this is heavy, it’s not so heavy that they’re difficult to move around. Because they’re all equipped with wheels and a handle, they can be dragged from place to place with general ease. They measure in between 35 and 52 inches in length, meaning they will take up a decent amount of space in your garage or shed. However, this is to be expected with any wood splitter you might purchase. Possessing built-in side rails, these splitters are equipped so that logs can sit atop them without any risk of rolling off. Having this type of log balance will not only help split logs evenly but will also serve to keep all of your log splitting tasks as safe as possible. The only drawback to the construction of this splitter is that it sometimes spills oil. This is not a huge problem but can cause stains on your garage or shed floor. All in all, when it comes to construction and design, the 5, 7, and 8-ton Boss splitter is one of the best in the business. It’s designed not only to perform its function exceptionally well but to thrive over years and years of use while doing so. Now, let’s talk about the splitters' overall ease of use. Whether you’re purchasing the Boss 5-ton log splitter, the Boss 7-ton log splitter, or the Boss 8-ton log splitter, it will be exceptionally easy to make use of. This is so for a number of different reasons. Positioned around 2 and a half feet off the ground, these splitters are exceedingly easy to load logs onto. This will save you back and arms a lot of stress when you’re trying to get a lot of work done in a short time. Because it makes use of electricity instead of gas, this splitter can be turned on with just the push of a button. Position your log, hit the button, and wait about 10 seconds for it to split. It really is no more difficult than that. It should, however, be noted that these splitters can struggle with logs that are on the larger side. In these cases, you’re going to have to do a little more work to ensure that the log is split. If you have a need to move your splitter around a lot, this splitter will accommodate that. Because it’s equipped with wheels, it can be transported from place to place with general ease. All in all, when it comes to ease of use, this is arguably the best log splitter on the market today. It’s not only easy to turn on, but easy to transport, and easy to operate as well. It may be on the expensive side, but it’s worth every penny. In terms of overall power, the Boss log splitters are pretty standard electric log splitters. Possessing 2 horsepower motors, they will operate as long as they are plugged into an electrical outlet. For their price, these Boss splitters provide fairly standard power capabilities. If you want something more powerful, you’re going to have to spend a great deal more money. In all, it takes between around 7 and 10 seconds for these splitters to split a log entirely. This is average when compared to other log splitters. It should be noted that, compared to many splitters, these ones from Boss are a lot more consistent overall. They struggle with large logs but make easy work of small and medium logs whenever they’re faced with them. For its price, the Boss splitters do a fairly standard job of splitting wood. You can’t really expect much more from a log splitter unless you spend a lot more money. However, if you just want to split small and medium sized wood pieces, these splitters have all of the electric log splitter parts to get the job done. When it comes to the overall noise level of these splitters, you’ll actually be pleasantly surprised. Considering the fact that they’re used to crack wood in half, they really aren’t that loud. In fact, they’re not even as loud as a push lawnmower. They can be most accurately compared to an air conditioner compressor. While they certainly make noise, these splitters are downright bearable. And, as always, if you’re sensitive to noise, you can always help to block it out by making use of some earplugs. Boss has released different types of electric log splitters, the Boss 5-ton splitter, the 7-ton splitter, the 8-ton splitter, and the Boss 10-ton electric log splitter; all of these splitters are a little different, but also much the same. But, how do they compare with other brands? Let’s start by comparing them to the WEN 56206 6-Ton Electric Log Splitter. While both splitters possess suitable 2-horsepower motors, the WEN is not quite as consistent in its splitting ability as the Boss splitters. The Boss have a tendency to struggle with larger logs, but the WEN has a tendency to struggle even with smaller logs. Apart from that, these splitters are very similar. They’re both easy to transport and very durable. The Boss just serves its function in a more consistent manner. It should, however, be noted that the WEN is a great deal less expensive. Next, we’ll compare the log Boss wood splitter to the Goplus 6-Ton Electric Hydraulic Log Splitter. As far as general construction, durability, and portability go, they’re so similar that there’s really no difference to be noted. However, when it comes to overall cutting ability, they are dramatically different. Like the WEN reviewed above, the Goplus 6-Ton splitter struggles to consistently cut logs of all sizes. This can make it a trying machine to use when you’re attempting to finish a lot of work in a short amount of time. The Boss only struggles with larger logs. It handles small and medium sized logs with absolute ease, splitting them consistently over hours and hours of use. However, due to its price, the Goplus might be a more attractive option for you. It’s about half the price of the Boss, making it a superb budget log trimmer overall. If you’re looking for something to use sporadically around the house, you might very well be interested in the Goplus. If you’re using your splitter in an industrial manner, you’ll be much better served by the Boss. The last comparison we’ll make with the Boss splitters is the Sun Joe LJ10M 10-Ton Hydraulic Log Splitter. Now here’s a splitter that splits just as well as the Boss splitters. The only problem is that it loses to the Boss splitters in almost every other aspect, including construction, design, and portability. Whereas the Boss splitters have wheels so that they can be easily moved from place to place, the Sun Joe sits completely flat on the ground. It can only be moved if you pick it up (which is not easy to do, considering it’s 87 pounds). Of course, if you plan on keeping it in one place, this won’t be a problem. The truth of the matter is that the Sun Joe is actually a little more powerful than the Boss. It can actually handle larger logs in general. The problem is that it possesses close to no mobility. If you’re choosing between the two, you must consider which you desire more: power or mobility. The Sun Joe provides more power, but the Boss provides more mobility.